With all the shredded zucchini taking up space in my freezer, I decided it was time to find some new recipes and thanks to Pinterest, I discovered one that Naomi and I absolutely love. While Naomi and I really like them, hubby and Lili have chosen not to partake. I don’t understand that at all, but hope that one day they will give them a try. 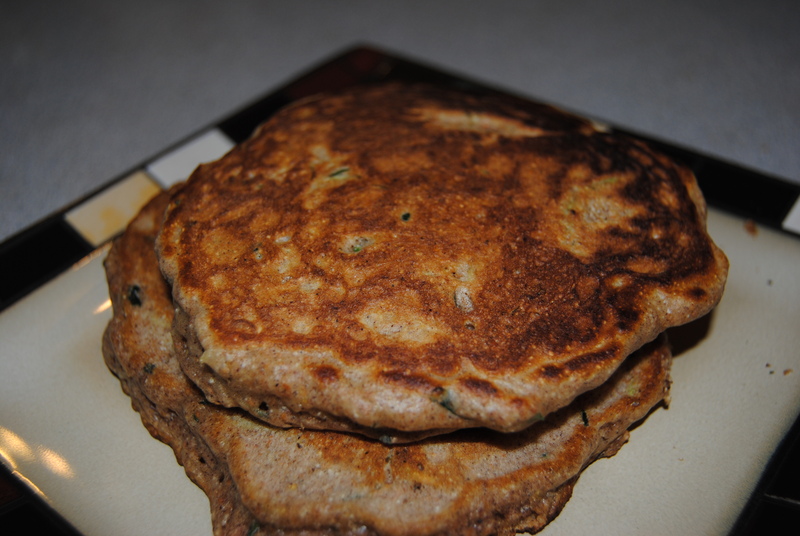 It’s a great way of adding veggies to our day and I have found that the addition of the zucchini makes them more filling than regular pancakes. 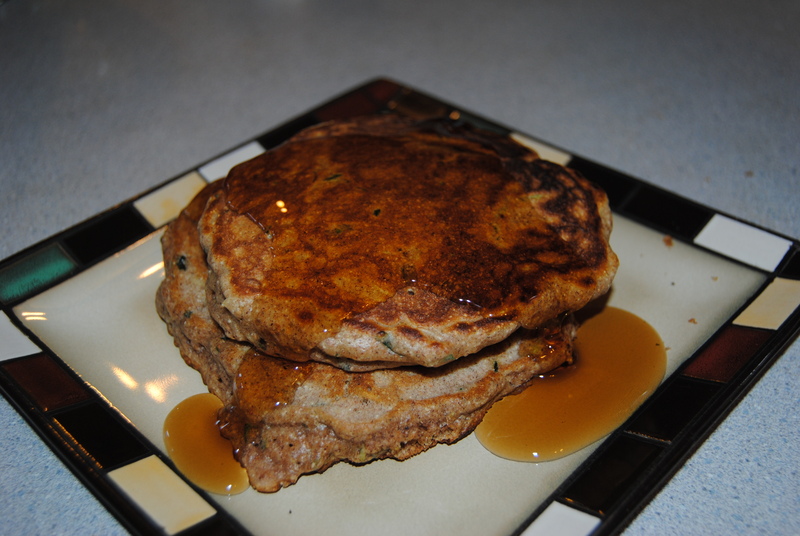 If you are looking for another way to use the zucchini currently living in your freezer or fridge, give these pancakes a try. In a large bowl, combine eggs, olive oil, sugar, sour milk and vanilla until smooth. Stir in zucchini. In another bowl, whisk together flour, salt, baking soda, cinnamon and nutmeg. Stir dry ingredients into wet, mixing until just combined. 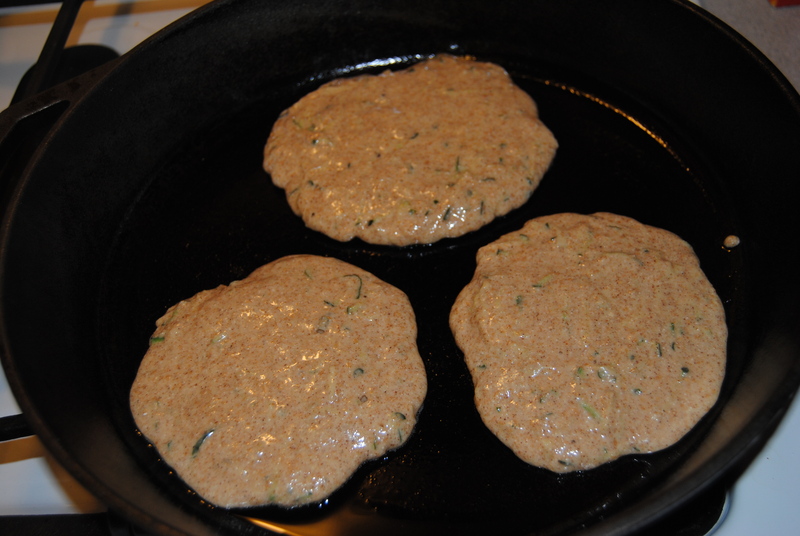 Pour the batter into the pan and cook until bubbles appear on the surface. Flip pancakes and cook another minute or two, until golden brown. Repeat with remaining batter. Serve with your favorite topping. I especially enjoy these with fresh blueberry syrup. Naomi likes them with maple syrup. Today we said good-bye to 2013 and hello to 2014 and I enter 2014 with some big hopes and dreams for the year ahead. A few days ago I shared four things I’m going to tackle in 2014. You can read that post here. Number 4 on that list was sure to be the toughest for me, but I did quite well having spent maybe 15 minutes on the computer today, until starting this blog post of course. And as expected, by not spending so much time on the computer, I got other things done which meant instead of sitting at the computer, I was up doing things which helped me tackle Numbers 1 and 2 on the list. 2013 is now in the past. It was a year of making big decisions and learning many new things. Now we enter 2014! 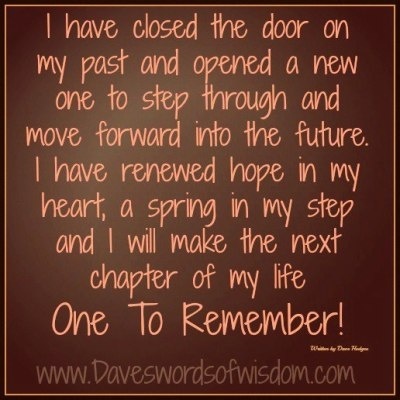 I’m very excited about what this year has in store for me and my family and am ready to make 2014 a year to remember!! In an effort to eat healthier and save money, hubby and I are challenging ourselves to a month of soups and stews in January. Breakfast will consist of something other than soup or stew and hubby wants me to throw in some variety at dinner once or twice a week, but our lunches and the majority of our dinners will consist of soup or stew, with sides of veggies when needed. Granted, some soups and stews aren’t necessarily healthy, but I’m focusing on those with meats, dried beans and/or veggies and avoiding ones with pasta and a heavy cream base. Healthy, warm, satisfying meals perfect for cold winter days and nights here in Central IL. Meals of soups and stews should also save us money. I have some meat and veggies in the freezer, veggies from our garden in the freezer as well as our garden tomatoes canned and ready for use. The addition of a few more meats, veggies and dried beans from the grocery store during the month won’t cost a lot and we’ll have many good meals on the table. Hubby is also committed to taking soup/stew to work for lunch each day. No going to lunch with co-workers or grabbing take-out somewhere for the entire month. That alone will save us a tremendous amount of money for the month. Another benefit is trying out some new recipes and becoming more disciplined about preparing and eating more meals at home. Our goal is to have more money in our bank account and lower numbers on the scale at the end of January. Less dependency and more self-sufficiency. I’ll report back on January 31st to let you know how we did. Visiting our son Ryan, can be a bit challenging. The town he lives in is a college town and finding places to take him that he can handle are somewhat limited. For those who haven’t been reading my blog long, Ryan is our adult son who has autism. He is at the lower end of the spectrum, non-verbal, with a related seizure disorder. Our visits are a change in his routine and while he typically does well (thanks to staff reading social stories to him prior to our visits), we still have to make sure that we’re doing things his sensory system can handle. When the weather is nice and warm, our visits typically include a trip to the park. It usually works well for both him and our girls. In the winter, a visit to the park just isn’t feasible, so last year my husband suggested that we include an over-night stay at a local hotel to our visits. This allows us to have a nice long visit with him, in a nice quiet environment. Okay, it can only be so quiet with my crew, so I should say in a less stimulating environment. I really am getting to the Pop Tarts part of this post. We typically stay at the same hotel for our visits, but there was no room at the inn for our last visit so we had to go to a hotel we had not stayed at before and won’t be staying at again. While we were getting ready to leave, my husband went to check out the free breakfast. The choices were really bad, except for the Pop Tarts he brought back for the girls. Not that Pop Tarts are necessarily a great choice, especially when you’re trying to avoid high fructose corn syrup, but at least our hungry girls would have a little something until we could check out and get them breakfast. It was also the first time they had ever had a Pop Tart and believe it or not, they liked them. Pop Tarts are something that I just don’t buy. Not that I haven’t bought them, because I have. Several years ago I was buying them on a regular basis, but I hadn’t bought any since Lili came home, so it’s been at least 5 years since they’ve been in our house. Let’s face facts, Pop Tarts are tasty and convenient, but we just don’t want those ingredients in our bodies on a regular basis. But did I mention Pop Tarts are tasty, so having them from time to time would be nice, as long as they are being made in my kitchen with my ingredients. Today, that happened. 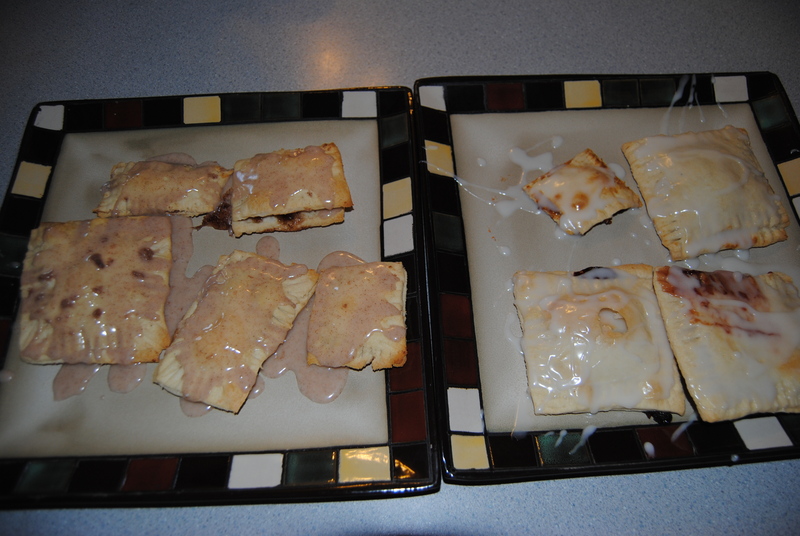 The girls and I made our own Pop Tarts. They didn’t necessary look pretty, but they sure were yummy!!!! We made cinnamon sugar, strawberry and blackberry Pop Tarts and as you can see, we made them in various shapes and sizes. Like most things you try the first time, it was a learning experience. We learned to not over-fill and to make sure that the sides are well crimped. Otherwise you’ll end up with them coming apart and filling oozing out the sides. Of course my 5-year-old told me, “That’s why they call them Pop Tarts.” LOL!!!! In our case, they were certainly popping. The crusts were nice and flaky, but the one thing that would make these even better is filling them with jam or preserves made from fruit in our garden. Until then, we will definitely continue to make our own Pop Tarts because they really are so much tastier than much better than those pretty ones that come in a box. Combine flour and salt in bowl. Add shortening or butter and blend with fork, or pastry cutter until fairly coarse. Place dough on a lightly floured surface and roll into a square/rectangle. Cut out long strips about 2 inches wide, and 3 inches long. Repeat till you run out of dough. Place powdered sugar in bowl. Pour milk slowly and stir. You want the consistency to be like thick syrup. Assemble: Take one pie crust rectangle, fill with a teaspoon of jam. Cover with another piece of pie crust. Crimp all four edges. Repeat until you run out of pie crust. Bake at 450F for about 7-8 minutes or until lightly brown. Allow to cool slightly then drizzle with glaze. Add sprinkles or sparkling sugar for added decoration. Then enjoy!!! Mix all ingredients until well combined then divide evenly among the pie crust pieces. Place another pie crust piece on top and crimp sides. For the glaze, add 1/2 t cinnamon to the glaze recipe above. I can vividly remember learning how to cook spaghetti in my local 4-H club. I remember how excited I felt about cooking my first spaghetti dinner for my family and even more excited that my dinner actually turned out to be pretty darn good. Cooking and baking was something I really did enjoy as a child and into my adult years, but somewhere along the line I allowed convenience to stand in the way of doing something I enjoyed. I got in a rut. It became easier to throw a frozen pizza into the oven, drive-thru at lunch or have hubby bring dinner home from the nearest Chinese restaurant. Gardening was another love I discovered in my early adult life – digging in the dirt, sowing seeds, planting starter plants, watering, weeding, watching things grow and enjoying the tasty fruits of my labor – it is so satisfying and rewarding to me, yet it was something else I allowed to be pushed aside for a lifestyle that is more convenient. Unfortunately, by trading in the things I enjoyed for convenience, I became someone else. I became someone I didn’t know and someone I didn’t necessarily like a lot. I became lazy and unmotivated. 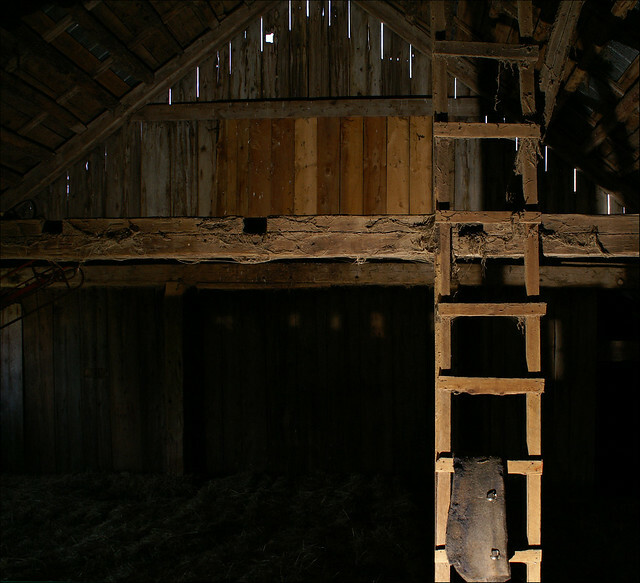 I honestly believe that homesteading will allow the real me to emerge. Living the homesteading lifestyle is like finding me again. To prepare ourselves for a life that is going to be very different from the one we’ve been living, I am making changes now. Instead of convenience, I am working harder and trying to be more creative. Instead of buying a loaf of bread at the grocery store, I’m making my own. Instead of having hubby stop for some take-out on his way home, I’m using what we have at home to create meals. I’m trying things I’ve not done before and setting goals to try more new things as the year progresses. Here’s a great example. Yesterday, Naomi asked for graham crackers. I haven’t been to the grocery store in about a week and didn’t have any graham crackers so she was out of luck. Or was she? I did a quick search on-line, looked in my cupboards and discovered I had everything we needed to make our own graham crackers. So, we got out the mixer and prepared the dough. 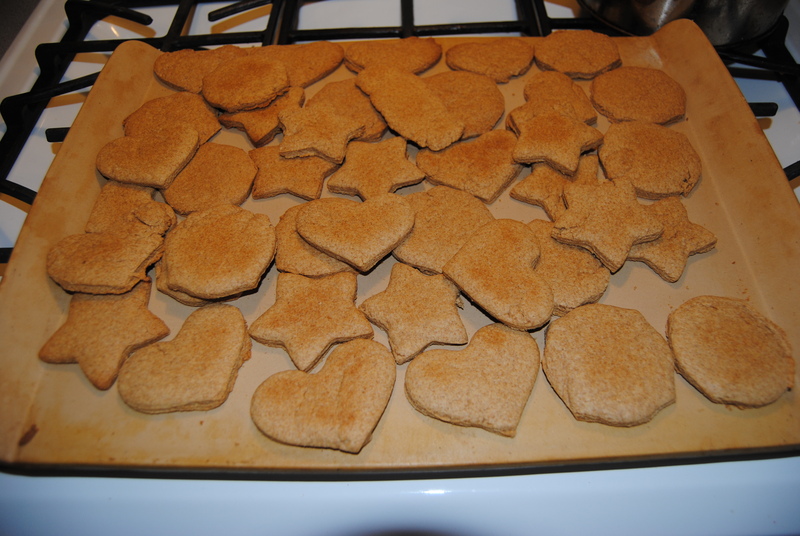 After lunch I rolled out sheets of graham cracker dough, pulled out 3 cookie cutters and let the girls cut out different graham cracker shapes. After 12 minutes in the oven they were done. They took about 45 minutes of my time, were fun to make and cost a fraction of what I would have spent on a box of graham crackers off a grocery store shelf. The girls and I did something we’ve never done before and we used ingredients I already had on hand. That’s homesteading and homeschooling at its finest 🙂 But the icing on the cake is the satisfaction and enjoyment I got from creating something fresh and tasty with my own two hands. There is so much to look forward to!! Like the day I can actually dunk my fresh, homemade graham cracker into a big glass of goat’s milk from our very own goats. That will be pure satisfaction and enjoyment for me!!! It feels good to be finding me again and you know what? I think I might actually like me! Lili has always enjoyed helping me in the kitchen, but now her help has moved to a new level. She actually asked to make her own soup. Not open a can, pour it in the pan soup, but write out her own recipe and make it herself soup (with a little help from mom of course). Here is the recipe she wrote. She came up with this recipe on her own and only asked me to help her spell the words. I helped cut up the veggies and chicken, then she put all the ingredients in the pot, set the stove to the temperature she wanted and stirred. She put in the spices and cooked it until it was done. I did suggest a couple of additions to help enhance the flavor of the soup a bit, but this was the finished product. Can’t wait to see what is on her menu next!! !